Playing with Papercrafting: September's Paper Pumpkin and Something Glorious Coming Soon! September's Paper Pumpkin and Something Glorious Coming Soon! Having just returned home last night from a late fall camping trip to visit my daughter on her birthday and have some fun times with my two little grandsons, I didn't have a lot of time to create for my blog post today, so it was a perfect time to get out my September Paper Pumpkin kit and see what I could do with it. It is such a gorgeous kit this time, with gobs of opportunities for alternatives, but I only got a couple of different ideas happening last night. I'll show you some more later. I think the quality of these Paper Pumpkin kits just keeps getting better all the time! 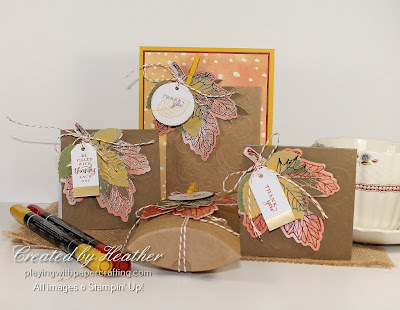 What I really liked about this one was the embossed kraft cardstock that the card bases and the pillow boxes are made of. I loved the texture those created, and ended up cutting up a pillow box, since I probably won't be using it, and using it as a panel on a larger 5 1/2" x 4 1/4" card. Here's a closer look at my projects now. Can you spot the differences? Instead of stamping my big leaf just in Cajun Craze ink, I also heat embossed some of them in Copper Stampin' Emboss Powder. That looks just stunning, especially against that kraft cardstock. I embossed some of the greetings in Copper Stampin' Emboss Powder as well and added an edge of copper around the circular tag. I cut up one of the pillow boxes to use as an embossed kraft panel on a larger standard sized card. 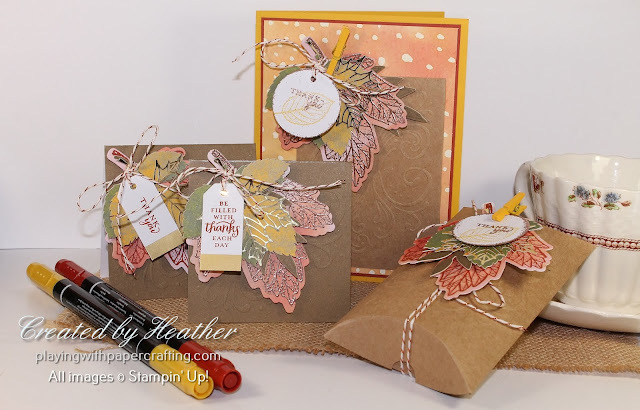 The base is Crushed Curry with a panel of Painted Autumn Designer Series Paper backed with Cajun Craze cardstock. 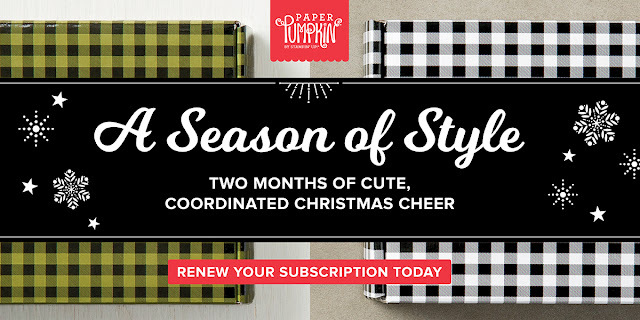 If you would like to subscribe to Paper Pumpkin, make sure that you go to PaperPumpkin.com and click on subscribe before October 10, because the October and November kits are coordinated holiday projects designed to help you with your gift and greeting card needs at this time of year. 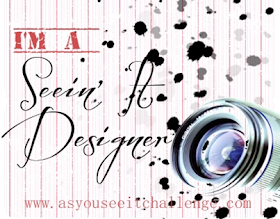 You can have fun creating and meet practical needs at the same time! As always, it was a lot of fun to do, without a lot of planning and designing which takes a lot of time. And I promised that I would share with you that something glorious is coming soon! 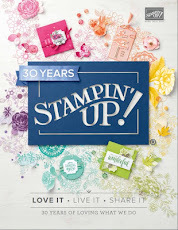 While there is not a definite release date yet for customers, from Oct. 1 -15, demonstrators are going to be able to order Stampin' Up's newest release - Stampin' Blends - a collection of alcohol markers for perfect blends when you are colouring and shading! I'm so excited about this because I've been missing our Blendabilities so much since they were taken off the market. 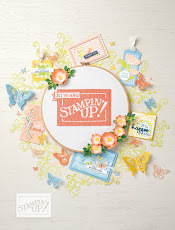 The problems surrounding them were remedied and the new offering has had extensive testing and has passed SU's rigorous requirements and now Stampin' Up! Demonstrators can buy them between the above dates. But it won't be long before customers will be able to get them as well, and you will be among the first to know as soon as a release date has been given! 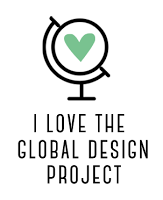 Mine are already ordered and I will begin to use them for projects soon. If you don't want to wait, I suggest that you sign up as a demonstrator and purchase the markers as part of your starter kit! It would be well worth it! 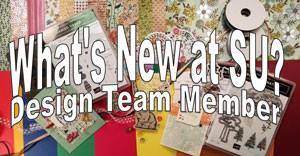 If you want to do that, click on Join My Team in the top menu and follow the prompts. Let me know ahead of time and I can give you the catalogue number to use to order the markers as part of your kit.